Walter Brueggemann dedicates his seminal work, The Prophetic Imagination: “For my sisters in ministry who teach me daily about the power of grief and the gift of amazement.” As he describes the grief and amazement that together shape the prophetic imagination, he also describes the story of many women in ministry—lamenting what is broken in themselves, the church, and the world while also imagining what can be. When I read his dedication, as a woman still learning how to lead, I was moved to tears. To have both the pain and the joy of this calling verbalized—even called prophetic—gave that tension value. I saw for the first time that God could use what previously had seemed to disqualify me. It stretched my own imagination of how God might use me and my sisters. 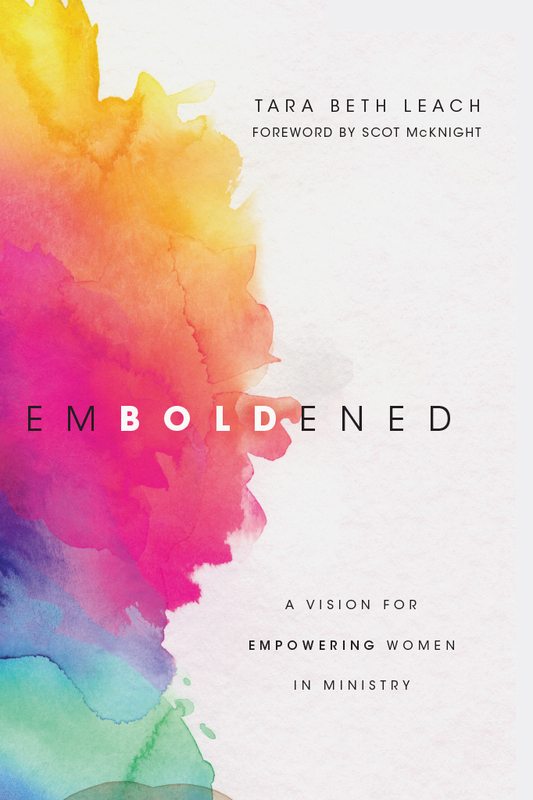 Tara Beth Leach’s book, Emboldened, takes me to the same place, where there is room for women’s burdens and for an imagination of what could be possible if we really did this thing we are called to do. With unapologetically maternal warmth and authority, Tara Beth sits with readers like a big sister. She makes space for the frustrations and pain without condescension or bitterness. She acknowledges the baggage and cultural challenges without leading us into victimhood. Above all, she presses forward with courage, joy, and imagination. The book has two main sections: Emboldened Women and A Vision for an Emboldened Church. These create a healthy balance: giving voice to the very real, personal issues women have to face while also placing those within our broader mission, weaving our healing into the healing of the church. While she speaks directly to her sisters, Tara Beth seems hopeful there are men reading over the shoulders of their wives and female students and colleagues, looping those men into this conversation out of her conviction that this issue will bring us all freedom—men and women alike. Throughout she references the debate about whether women should lead but spends little time defending. Setting aside the conversation about whether women should lead allows Tara Beth to instead share how women can lead. And while she describes this well, what is even more powerful is how she models it in her authoritative and pastoral tone. Once we step away from arguments that ask us to defend our call, women can talk about their call in the way they often experience it—love. Whether they express it as love for a mission, a group of people in need, the church, the Lord or all of the above, most ministry women I know are motivated by love. Love does not seem professional and it certainly will not win any arguments to justify our calling. But as Emboldened calls us toward a better imagination of what can be for us, for the church, for the world, it is not an imagination fueled by bitterness or ambition but by love. Throughout the history of his engagement with his people, when God has wanted to stretch our imagination, he has embodied a new reality—by gathering a nation, by coming in human form, by creating his church. And the witness of those embodied truths has spoken volumes. Any caricature we have had of him or of ourselves is shown to be two-dimensional in the face of a community living shalom and in the face of a God who now has a human face. The same is true of God’s desire to stretch our imagination of leadership. We would all agree that our image of Christian leadership has become warped. And we would all agree that the conversation about women in leadership has become toxic. It is time for a new way to imagine what leadership looks like, to imagine it beyond power-struggles and us-and-them language. It is time to reimagine what shared leadership looks like and discover the unique gifts women can offer for the flourishing of the church. And as we do, we will not only empower more children of God to live out their gifts, we will rediscover who we are as the church. And so, at such a time as this, God is raising up women to not only talk about but to embody a new kind of leadership. And women like Tara Beth embody a Christlike leadership which cannot be ignored. Her passion and generous spirit, her conviction and humble boldness reveal to us the very Spirit of God and his heart for his church.